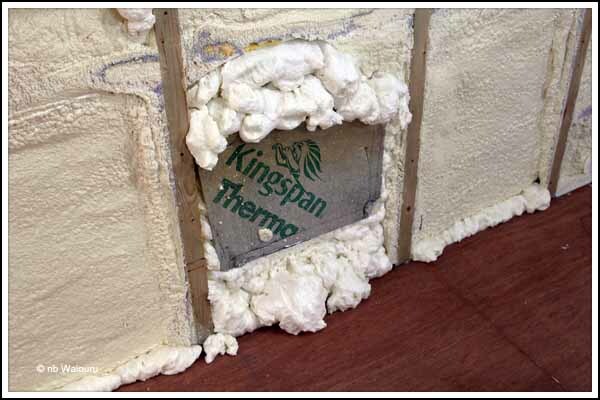 Last of the Spray Foam…… Please! Richard (joiner) arranged for his father to purchase five 750ml aerosol cans of spray foam insulation which duly arrived at the boatyard today. There was a brief discussion about who was going to do the applying as no one on site admitted to having any prior experience. I learned many years ago to never volunteer! I’m the customer, so surely someone else must take the responsibility. However, I’m also mindful that yours truly will be allocated the task of cutting back the applied foam, so perhaps it might be better if I did the foam application. In the end it was me who did the online research on how to apply the foam and with some trepidation I started using the first can. 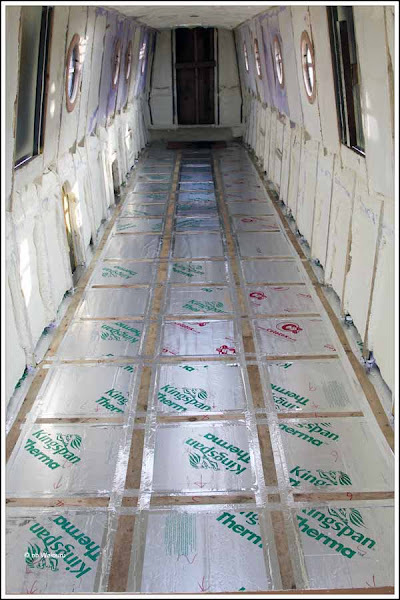 The data sheet stated there was 35 litres of foam in each can and the area to be covered should be moisturised. After leaving the cans to reach room temperature I shook the first one for 30 seconds and then carefully screwed the long nozzle and head onto the top of the can. The foam is applied by inverting the can and pressing on the top of the nozzle. I was mindful of two important points. The first is the foam will almost double in volume after the initial application. The second was you need to keep going to avoid the foam setting in the nozzle. After ensuring the floor area was clear of obstructions I donned gloves and glasses before using one of those kitchen cleaner sprayer full of water to moisturise the areas requiring treatment. . The first can didn’t last very long because I attempted to fill in one of the bare steel panels where the original foam hadn’t been correctly applied. The foam just ran down the wall instead of sticking to the vertical steel surface. A change in technique was required! With the last of the foam I squirted a small amount of foam onto the three bare steel panels and then quickly cut some Kingspan to roughly the shape of the panel and pressed it in on top of the foam. Then I filled in around the Kingspan with the second can of foam. It looks rather ‘rough’ but I can cut back the foam. The last of the cans had been emptied before the task was complete. It probably needs half another can to finish the job. Richard will bring one with him tomorrow. The next task was to cut back the foam. It’s not as dense as the commercially applied foam. More the consistency of a foam mattress. This actually made it easier to cut and I completed the job with my ‘Leatherman’ in less than an hour. Tomorrow the last few holes will be filled and cut back using the 6th can. In the afternoon I made a start on sealing the reverse side of the sheets of plywood for the wall lining. 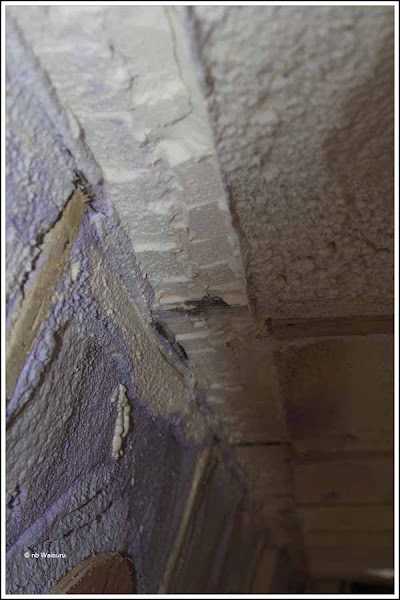 It’s not essential to do this, but timber breathes and there is a possibility condensation will form in the void between the spray foam and the back of the plywood lining. I don’t want the plywood to rot or; more likely; discolour. So the 22 sheets need to be sealed before they are fitted. The sealer is applied using a roller and a long pole! Seven sheets were completed before work stopped for the day. Richard has kindly agreed to come in tomorrow morning and assist with the vertical stacking of the remaining 15 sheets which will enable me to seal them over the weekend. Richard and James plan to start on installing the wall lining next Tuesday. This afternoon Andy informed me the ceiling ply is away being laminated. Jan has chosen satin off-white as the colour. Whilst we were discussing the build I reminded Andy the speaker cable was required before we could install the ceiling. Hopefully the cable will arrive early next week. A couple of days ago I wrote about the frost on the roof of Waiouru and how it had remained longer than the adjacent boats. I optimistically thought this might be due to Waiouru’s improved insulation. Today, Bill stopped for a brief conversation and explained why the frost had taken longer to melt. Amongst his many other talents; Bill paints boats. He explained the frost will linger longer on new paint due to the viscosity of the painted surface. Essentially; dew clings more easily to new paint, hence the frost! Drat; nothing like having your optimism crushed! Now for the latest project. Using a jigsaw I’ve cut four 700mm x 50mm lengths of 5mm steel strips from the old cratch deck which Dennis removed from Waiouru last December. These have now been drilled with 22mm holes and primed. Have you worked out how they will be used? This next photo may assist. Yes, there is now a mooring pin in the photo. Well if you haven’t worked it out, I will explain. 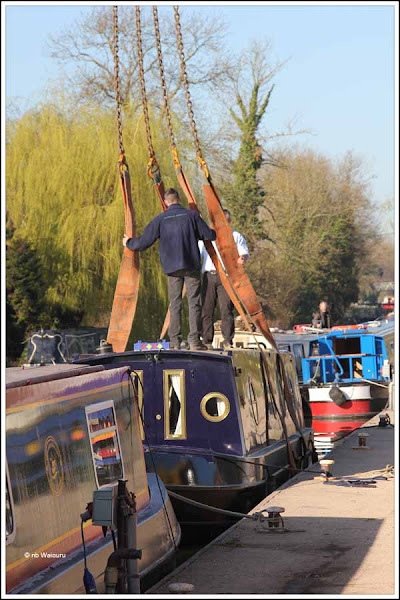 We’ve noticed from previous canal holidays, there are locations on the network where the banks are very soft and mooring pins can easily get pulled out through the effect of passing boats. I decided to make some ground anchors. 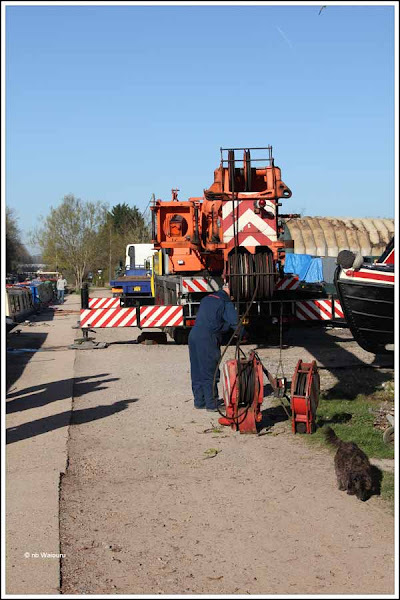 The end hole will take a shackle for the mooring rope and the other holes enable multiple mooring pins to be used. 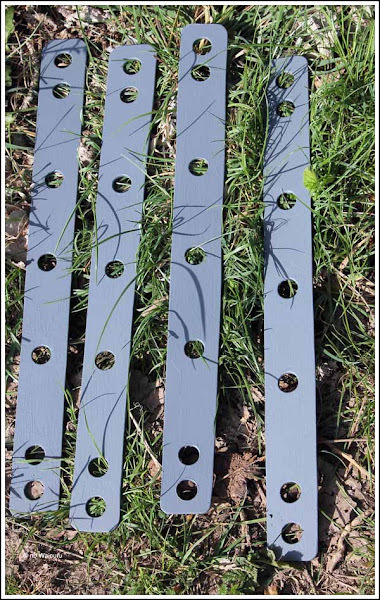 The holes in the ground anchors are larger than the diameter of the pins. 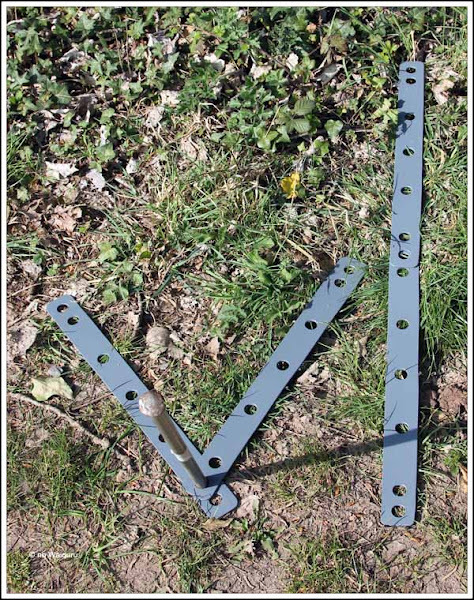 This enables the pins to be driven into the ground on an angle. Alternate pins in the opposite direction. 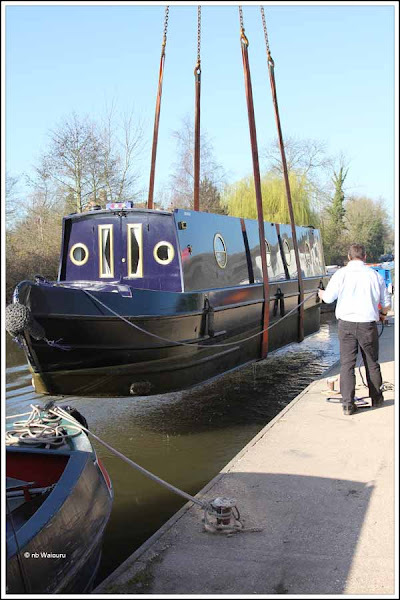 The end result is a more secure mooring point. 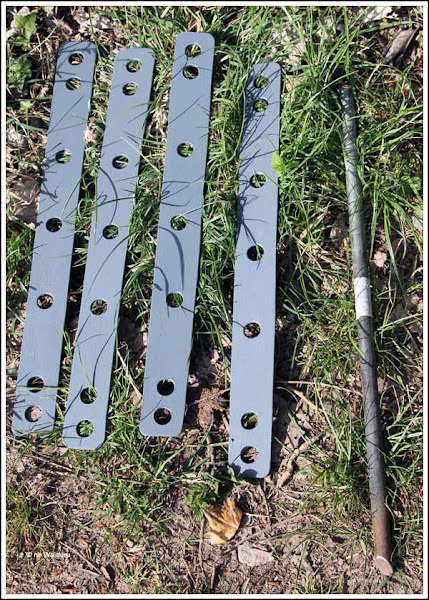 The anchors can also be used in combination as in the following photo. A strip on the right and a ‘V’ on the left. Other options include a triangle or a ‘Y’. This is still only a theory and it will be interesting to see if it actually works in practice. Now the boat beside Waiouru has been moved we have finally been able to see her minus the graffiti. The timber for the wall lining arrived early this morning and is now in the workshop waiting on the joiners to complete the last of nb Cats Whiskers. Hopefully they will make a start on Waiouru before the end of the week. Andy confirmed the laminated ceiling panels are on order and due shortly. Jan has chosen “off-white” as the colour. Her thoughts are that having a laminated ceiling will make it easier to keep clean. This morning we both noticed the frost on Waiouru’s roof. The two adjacent boats didn’t have any frost on their rooves which has me wondering…… WHY? 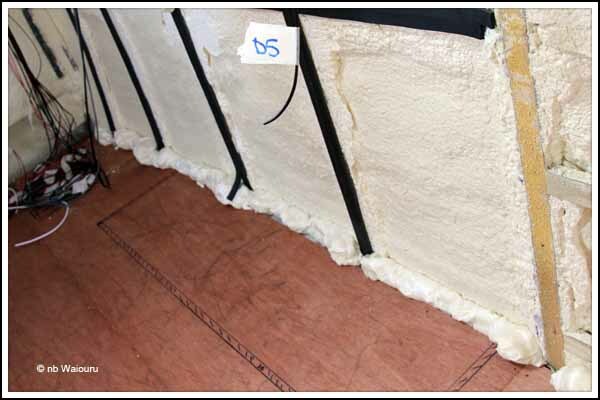 Is the insulation in Waiouru better; or was the interior colder? I guess time will tell! 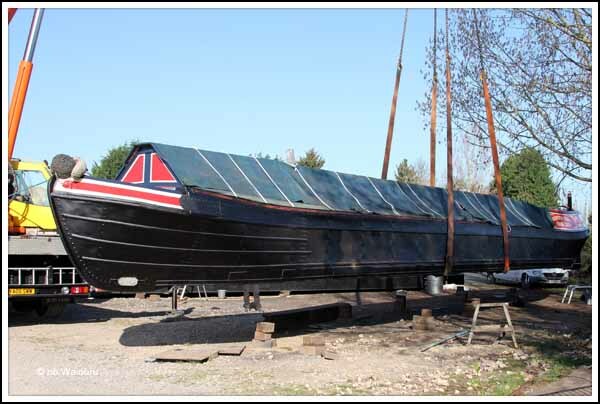 Two boats out, one in; and one moved to a new site in the yard ready for painting. However before any lifts occurred the mobile crane operator had to change the pulley block. The single pulley block was changed to a double. 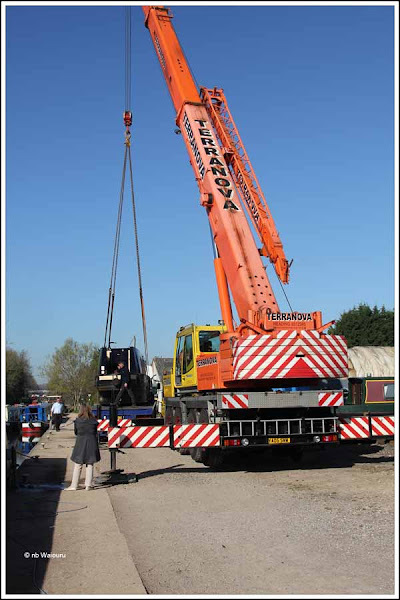 Once the crane was prepared the first lift took place from the water to a truck lorry (I’ll get it right one day). Slings underneath and then adjusted to ensure the boat is balanced when lifted from the water. It would be most unfortunate if the boat were out of balance and slipped from the slings. A 90° turn to the right and it’s on the lorry. 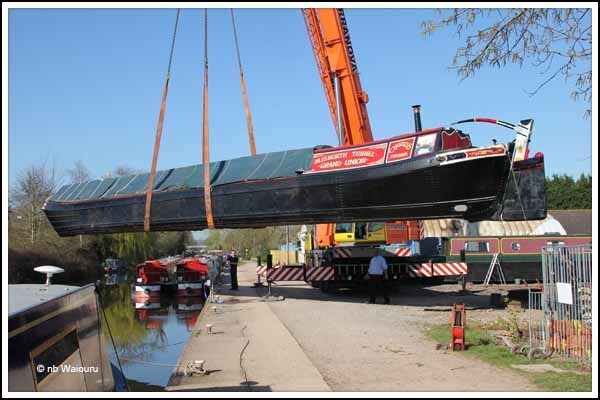 As the lorry departed the boatyard for Birmingham the crane manoeuvred to lift Paul’s butty, Cygnus into the water. This was the most technically challenging lift of the day. Then the last two lifts took place. The boat beside Waiouru has now been moved, and for the first time in many months we have a clear view of her port side. I must take a photo of Waiouru tomorrow morning when the sun is in the right position. Meantime, I’m working on a little project using some of the steel deck cut out of Waiouru last December. I just happened to notice something interesting whilst looking online to hire a car from Enterprise Car Rentals. After finding the local depot (Newbury, Berks) on the Enterprise website and entered the proposed hire dates the website quoted £53.47 for the weekend. This seemed considerably more than the price we had previously paid when renting from their Crewe depot in Cheshire. So I entered the same dates but used Crewe as the pick-up location. This time the price was £31.97. 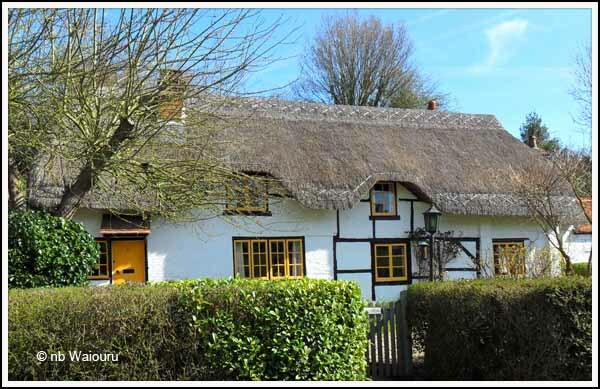 Renting from Newbury cost 40% more. Next I changed the pick-up location to Reading, and again the price was 40% more than Crewe. I assume the increase in price is because we are further south and nearer London. If this is the case then I will be suggesting to relatives and friends arriving from overseas that they should consider entering the UK via a more northern airport and hiring a vehicle in that location. A 40% saving on one months car rental would be well worth the effort! Meanwhile, I’ve been checking Google Analytics to establish whether there is any new reader traffic for my ramblings. If I can identify other boaters blogs I like to add their blog to our own list. I’ve also gone back to toying with the idea of transferring from Blogger to Wordpress. More reading required! It was a lovely quiet morning, too good an opportunity to miss going for a walk. My route took me to Woolhampton then Midgham before finding a footpath that took me in a northerly direction and then east. Along the way I came upon this horse. 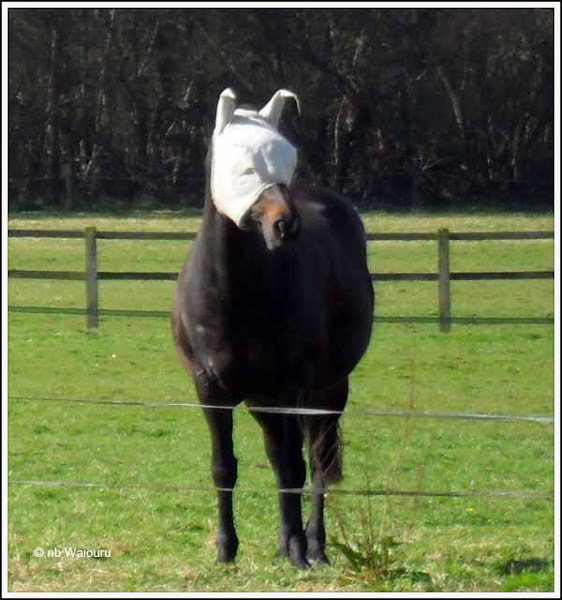 Not being equine orientation I was puzzled by its headgear. My initial thought was it had something wrong with it’s eyes. Perhaps a recent operation? The horse could obviously hear me as it kept facing towards my location. I decided to consider the situation in more detail and rested my forearms on the fence. I’d become fixated over the horse and failed to notice the top strand was electric. As a consequence I lost all interest in the damned horse! Down one country lane this pretty cottage caught my attention. Walking provides an opportunity to contemplate what has been completed on Waiouru and also reconsider future plans. One concern has been the length of the cross-over bed. Naturally we want it as long as possible. I realised the vertical timber battens on the steel framing below the gunwales was using 2” of the interior width of the boat. 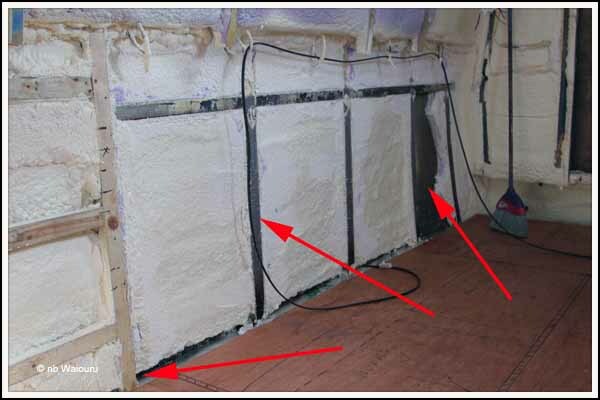 Reading Marine had already mentioned they didn’t fit timber battens to the steel but instead insulated the steel with tape and then directly screwed the plywood to the steel frame. If we did this in the bedroom we could “reclaim” two inches of internal width. This afternoon I removed the vertical timber battens off the steel framing in the bedroom and cut back the spray foam. The foam is still more than an inch thick so that isn’t a problem. 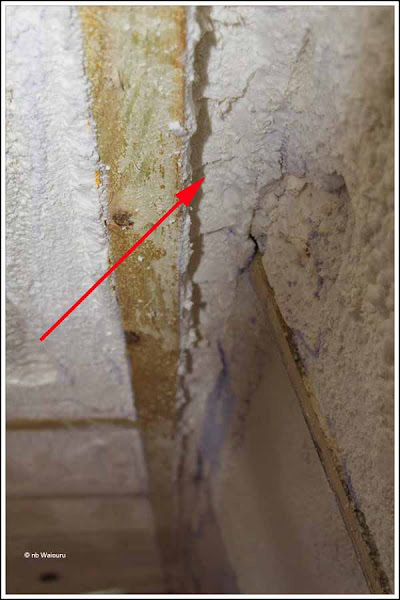 I also discovered more spray foam in one section that hadn’t bonded to the hull (right arrow) so this was removed. 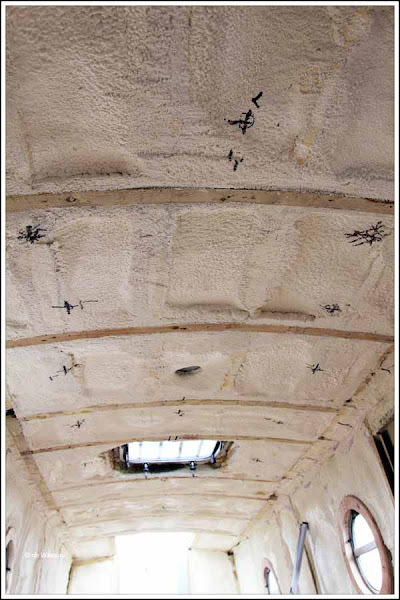 The remaining spray foam was cut back to the thickness of the steel framing (middle arrow). The bulkhead (partition) between the bathroom and the bedroom will be set back an additional inch on either side of the boat thereby giving us an additional 2” of width in the bedroom. Late in the afternoon Ruth and Gary (the owners of nb Molly) visited and we had a very pleasant time discussing many boating related matters. Gary also kindly showed me a few more features aboard Molly which we will be able to employ whilst she is our temporary home. The smooth, sensual feeling of latex caressing my skin. Jan stared wide eyed with excitement. I was about to make her day……… By donning the washing up rubber gloves and doing the breakfast dishes……. Hah fooled you! 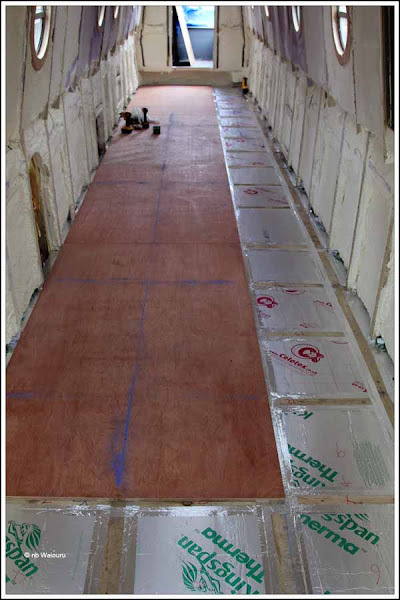 Not much more can be done on Waiouru until either the coaxial cable or timber laminate and lining ply is delivered. Consequentially we have had a quiet day soaking up the spring sunshine. No boats can head west of Aldermaston Wharf because an electrical fault late yesterday cut the power to the Aldermaston lift bridge. I’m somewhat surprised the two trapped groups of hire boaters were not grumbling. I would if I’d paid to hire and boat and couldn’t leave the base. 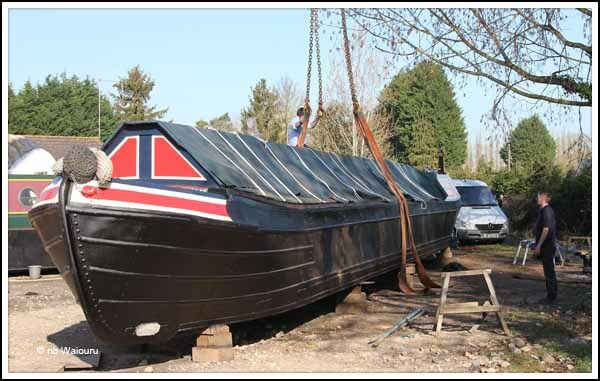 Meanwhile Jeanette and Paul were working tirelessly on their butty Cygnus, in an effort to complete as many jobs as possible before she gets lifted back into the water next week. 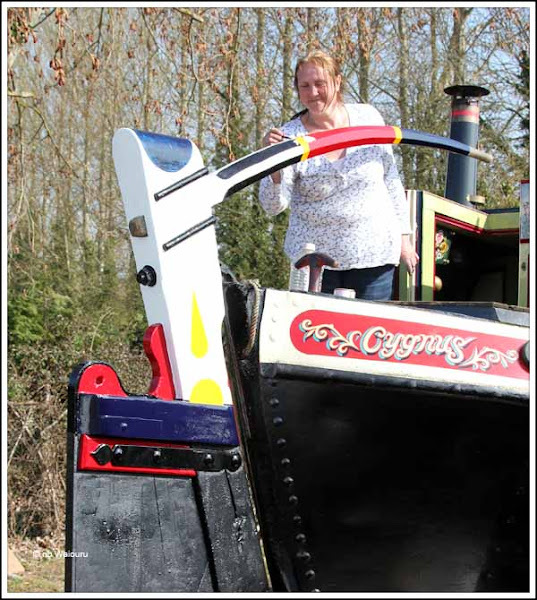 Jeanette has been making a very good job of painting the head of the rudder and tiller. Paul has been splicing cordage for the hold covers. Back in the workshop it was possible to see the fancy woodwork Richard and James have been producing for the doors on nb Cats Whiskers. This next photo is a close up of the detail. Richard explained the most difficult part of the job was creating the jig for the router. 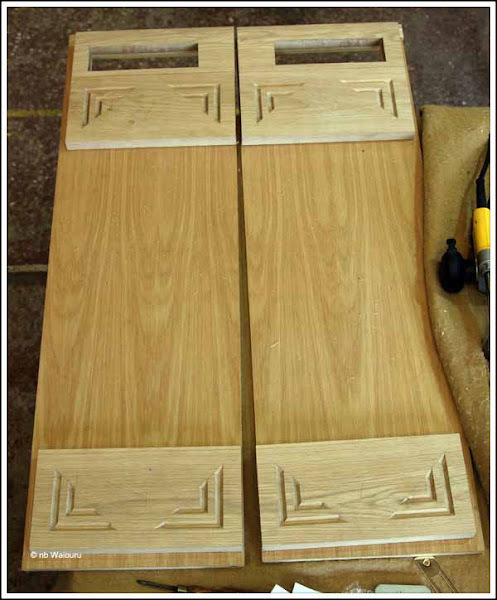 However the last of the design was cut by hand with a sharp chisel. I’ve suggested he doesn’t lose the jig as we may want something similar on Waiouru. Jan and her apprentice (me!) finished the 12v wiring in the cabin. There is some remaining wiring to be done in the bow (horn, headlight, etc) and we haven’t touched the engine compartment. The Empirbus system reduces the lengths of the cables and the only real difficulty we experienced was securing the cables to the ceiling. I tried using small cardboard squares stapled to the timber battens as cable supports. However this wasn’t successful. 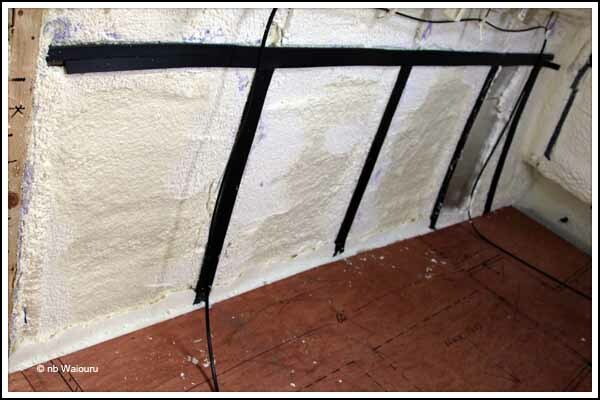 In the end we opted for masking tape and; where necessary; stapled the tape to the spray foam or battens. It’s not very secure but only has to hold the cables until the carpenters fit the ceiling next week. The locations of the three Empirbus nodes are starting to accumulate a significant number of cables. The 5 metre HDMI cable ordered on Amazon two days ago arrived and is already installed. You can see one end of it (red arrow) in the following photo. 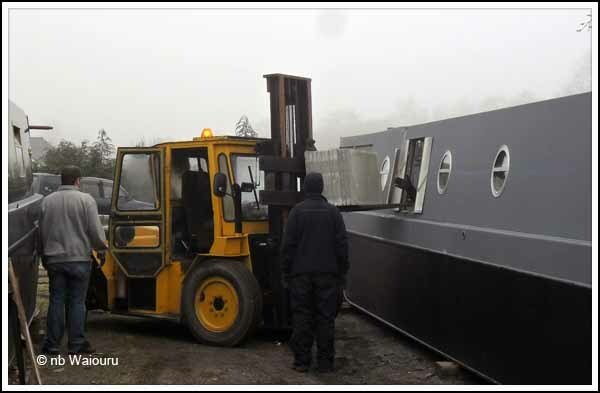 The Network Media Tank (NMT) and satellite dome controller will be in the top portion of the display cabinet which is located on the centreline of the boat adjacent to the diesel stove. 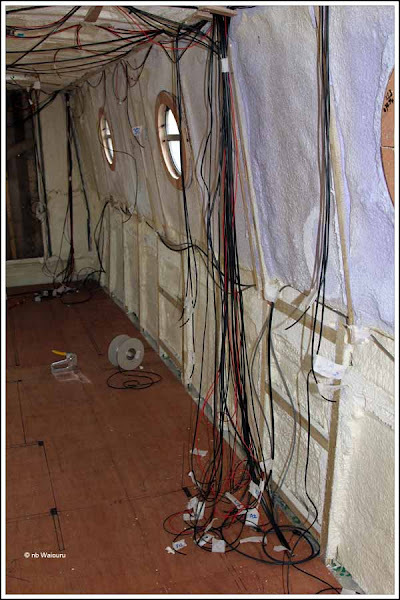 The HDMI cable runs between the NMT and the main TV which is in a cabinet on the starboard side of the boat. 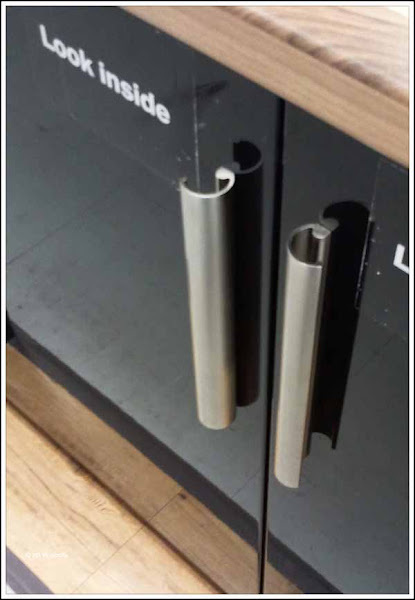 There is a flexible conduit duct between the display cabinet and the TV. This will be used for the satellite dome feed to the TV. I’m also waiting on some coaxial TV aerial cable. The terrestrial antenna will be located at the front of the cabin. There is a small TV in the main bedroom and the large TV in the saloon. So the coaxial cable needs to run from the entry box in the cratch to the main TV cabinet where it will be connected to a 12v amplifier. From there is goes to a three way splitter. One feeds the small TV. The second feeds the main TV and the third feeds the NMT which containers two TV tuners for recording live TV. The idea is to have both terrestrial and satellite coverage. There’s currently no available funds for a satellite dome; hence the conduit and drawer cable. Today, Andy and I had a brief discussion about configuring the Empirbus system. The system usb port will be located on the instrument and gauges panel. Andy made the sensible suggestion that we keep a backup copy of the initial configuration file. Then when I start playing with the configuration and totally muck-up the system I’ll be able to reinstall the initial configuration. I’ve already decided the extractor fan in the bathroom will be configured to run for five minutes after the shower pump has been turned off. There will also be a master switch beside the bed to shut down all non essential consumables. That way we won’t have to go around the boat at night turning everything off (or forgetting to!) The Hurricane central heater will be linked into the system. If we are away from Waiouru we will be able to send her a text message to start the Hurricane and run for a pre-set time. I can already see I’m going to have fun “playing” with the configuration! Jan and I made a start on wiring the 12v circuits today. We’ve probably managed to complete 50% of the task but had to stop when we ran out of red cable. The Atlantis Marine Empirbus (canbus) system certainly uses less cable and it’s easier to run the short cable lengths to the nearest ‘node’. We have been labelling the ‘node’ ends of the cables with the module code number. Hopefully this will make it easier for the connections to be made once the nodes are installed. I also managed to complete the installation of the flexible conduit ducts and then ran drawer wires for the mobile phone aerial, sat dome and solar panels. Well it was a rather busy day; but when you look at Waiouru you wouldn’t believe it! 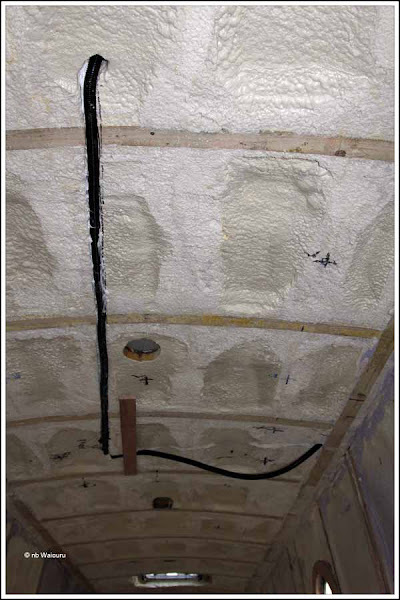 The flexible conduit was cut to length and channels cut through the spray foam using Richard’s oscillating portable saw. Then I made a start on gluing the conduit sections into the channels. The long run down the ceiling wouldn’t be required if the satellite dome mount on the roof had been welded in the correct position. But it isn’t. No good crying about it. The issue had to be resolved. Most of the day was spent with Andy checking yesterday’s marking out of the layout on the floor and remarking/adjusting the lines. They were then overdrawn in felt tip pen. He also added more detail, such as the swing of the doors, location of drawers, etc. The isle through the boat is now marked and I’m rather pleased we have a reasonably straight corridor through Waiouru and (importantly for me) it’s not against the side where the Tumblehome (slope on the side of the boat) tends to restrict movement at shoulder level. 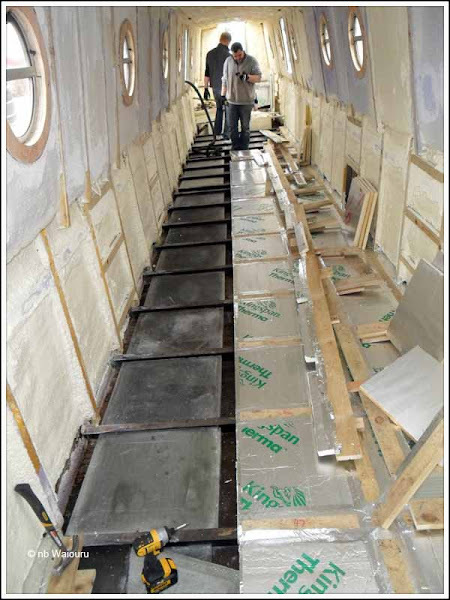 We spent a significant amount of time ensuring the galley space was maximised. The fridge/oven/microwave cabinet was double checked to make sure Jan’s wall oven will fit. I hope she will be pleased with the number of below bench cupboards. In addition to the pull out pantry there are five 500mm and one 400mm cupboards. Jan will now need to decide how many of them will be drawers rather than cupboards. There will also be shallow drawers on rollers behind the kickboards. The rear cabin has proven to be rather problematic. I want to locate the washer dryer as far as possible towards the stern bulkhead. Whilst we have the washer/dryer dimensions I’m not convinced they include the water inlet and drain connections. 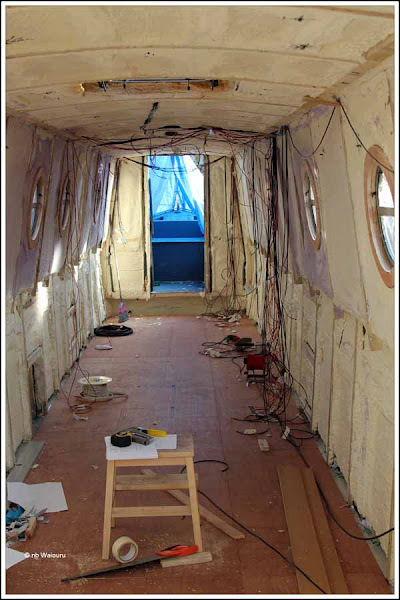 After some discussion; Andy, Richard and I agreed we will leave the final mark-up of the rear cabin until the washer/dryer arrives next month. Tomorrow’s plan is to complete the installation of the flexible conduit and make a start fitting all the wiring going above the gunwale. Yesterday I mentioned cutting back the spray foam to create a cable duct. The new duct isn’t that obvious in the photo below, but there is actually a 2” wide x 1” deep channel to the right of the timber batten. In a few places the timber batten has “popped” away from the steel roof batten so I’ve removed these sections and cut back the foam underneath so they will fit correctly. The plan is to refit the sections of batten tomorrow. Not all the floor has been marked out. It was almost impossible to see the pencil lines in the photo so I’ve overlaid them using red lines. Starting on the left; the first rectangle is the toilet and the second is a 900x720mm shower. The bedroom has a 5ft cross over bed with a 1ft wide lowboy either side. At the end of the cabin are two x 18” deep wardrobes either side of the door. On the right side is the bathroom cabinet, towel rail and corner vanity. There is a full length footlocker in the bedroom. I spent most of the morning working out and marking the location of the ceiling and wall lights. There are nine ceiling lights in the saloon and seven in the galley. Four each in the bathroom and bedroom. The bedroom also has two wall lights, There is one wall light in the bathroom above the hand basin and a further four wall lights in the saloon. Late this afternoon I made a start on cutting back the spray foam on the ceiling for the first of the four runs of 20mm flexible conduit. The longest one runs from the satellite dome mounting on the roof to the control unit which will be in the display cabinet. A second length goes from the display cabinet to the TV cabinet. 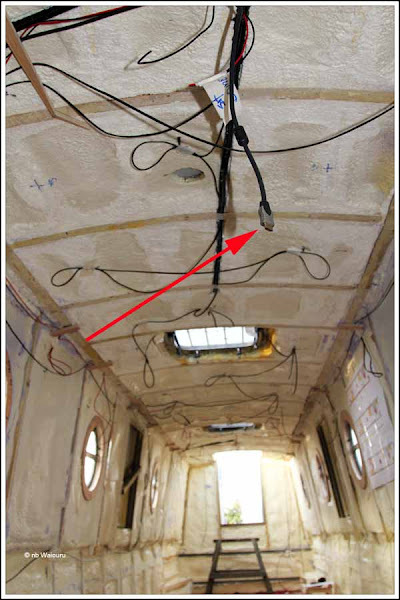 The third length will run from the proposed future solar panel mounting point to the channel I’ve cut down the length of the boat on the ceiling. The last length runs between the mobile phone aerial mount on the roof and the ceiling channel. Once they are all glued in place I’ll run some ‘draw cables’ inside them. We have already purchased three weatherproof terminal caps for the roof ends of the conduit. Tomorrow should see the end of the marking out. 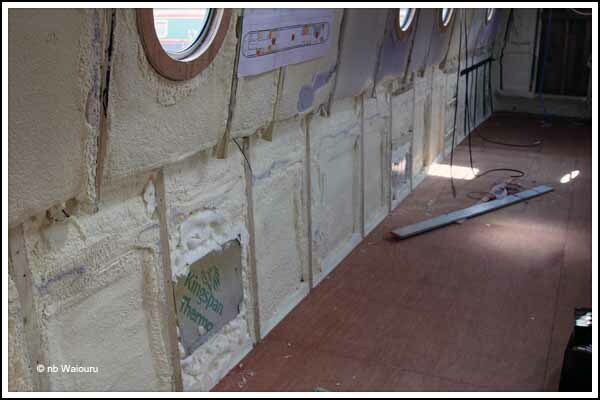 Just when I thought the last of the cutting back of the spray foam had been completed I realised a channel needed to be cut the full length of the boat either side where the tumblehome meets the roof. This channel will be used as a 12v cable duct. It was another of those dirty jobs above shoulder height with copious quantities of spray foam dust falling onto my face. Hopefully it’s the last spray foam I’ll have to cut back! Immediately after lunch I drew a pencil line down the centre of the floor. 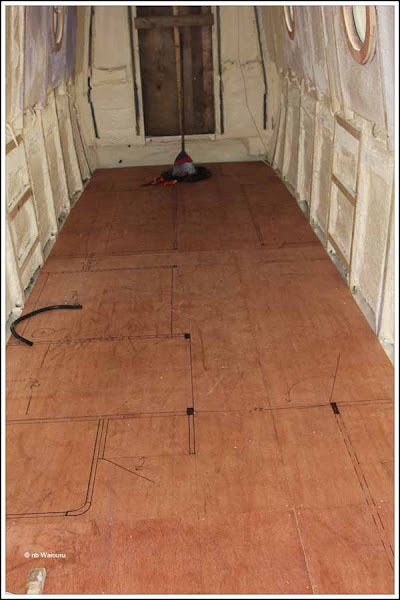 The was achieved by finding the centre of the front and rear cabin doors and then dropping a line so the centre could be marked on the floor. The centre line down the length of the boat was then illuminated using a laser line. By placing a small block of wood on the floor in front of the beam it was possible to draw a series of pencil marks on the plywood floor. These marks were then joined using a straight edge. 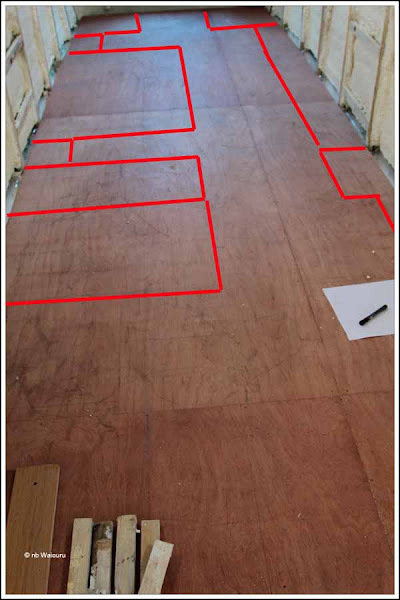 This centre line becomes the main datum line (reference line) for marking out the boat. Later in the afternoon Andy, Richard & James made a start on making the boat layout on the floor. By the end of the day all the partitions and major components had been drawn on the floor. Comet had replied to my query about the depth of the Candy washer/dryer we have ordered. It stated 44cm on their website, however I’d seen 52cm on another site. They have confirmed it is 44cm and it will therefore fit in the back cabin. Originally we had planned to fit the Engel fridge/freezer under the bed in the back cabin. However the full width blackwater tank under the floor means there is now not enough room. As an alternative, it will probably be possible to fit it on top of the Candy washer/dryer (with some “jiggling around”). Andy has come up with another idea for the size and location of the electrical and instrument cabinet. It had been my intention to have it mounted high inside the back cabin on the starboard side. He has suggested the Beta Marine panel be mounted in the cockpit on the port bulkhead. 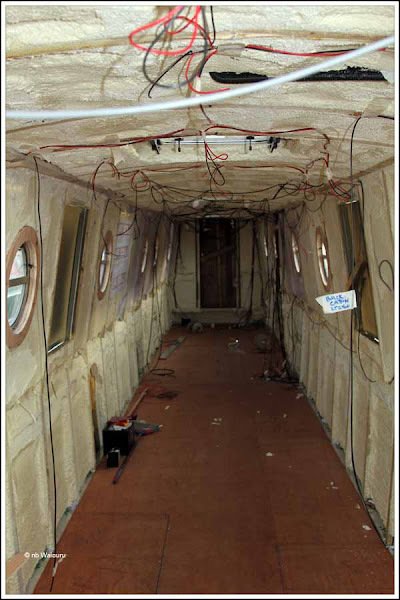 All the other gauges can be located inside the cabin on the opposite side of the bulkhead. The inverter/charger can go under the bed. The plan is to complete the marking out of the boat tomorrow and make a start on the wiring the following day (Wednesday). And it won’t be the last time! It was raining when we left Aldermaston Wharf, however by the time the train reached Newbury the rain had departed leaving a grey sky. The first task was to go to B&Q (Bunnings Oz or Placemakers NZ equivalent) where we each handed over our completed application form for an “over 60’s” discount card. From now on all B&Q purchases will be made on a Wednesday where we will receive a 10% discount. We took the opportunity to walk around the store and get some ideas on fittings for Waiouru. Jan rather liked these cupboard door handles. We have already decided we are NOT having “button” style door knobs. Ufton had them and we were constantly catching pockets and belt loops whilst walking past. After some discussion we’re now considering having no handles. Instead we might ask for the lip of the door to be rebated as a finger grip. Jan had something similar to this on her kitchen cupboard doors in NZ. In the bathroom section we looked at taps. 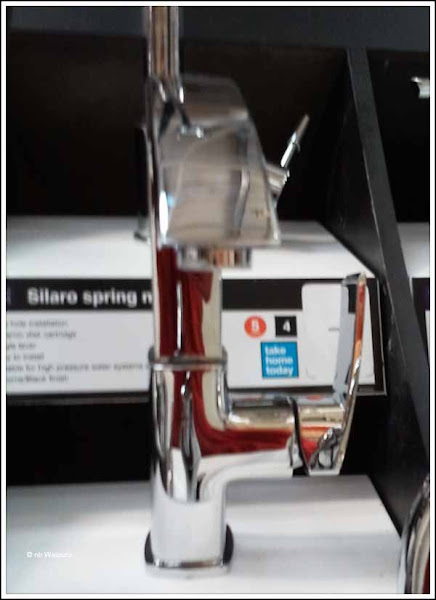 Space on Waiouru will be restricted so we have decided the sink and hand basin taps should be of the “mixer” type with a single tap and a high outlet that can be turned to the side. The following photo isn’t very good as it was a quick snap with the mobile phone, but it provides and idea of what we are considering. Dunelm Mill was opposite B&Q so we walked across to look for a duvet cover. Nothing of interest caught Jan’s eye! We then took the towpath into the town centre via Greenham Lock. Jan got her weekly fix (woman’s magazines) whilst I had a close encounter with the barber. I’ll probably see him again in three months. Next stop was window shopping at a dental surgery. I always attempt to treat myself to an annual dental check on my birthday and I’m now three months overdue! Why on my birthday? The twisted and sick people running the NZ Army scheduled your annual dental check using your birthday and after 24 years of it I couldn’t shake the habit. Back in Oz I could usually render the receptionist speechless by phoning up and saying “Hi, it’s my birthday in a fortnight and I’d like to treat myself to an appointment with the dentist!” Unfortunately I’m reasonably certain I have a small cavity requiring attention. Jan has already filled me with dread by mentioning she had read online the cost will be approximately £300. There was just enough time to nip into Sainsburys and purchase some essential supplies before catching the train back to Molly. Jan went off for a walk through the local woodlands to the salmon farm. One of the swans in the wetland was rather aggressive, which is a sign spring in near. She also came across these. 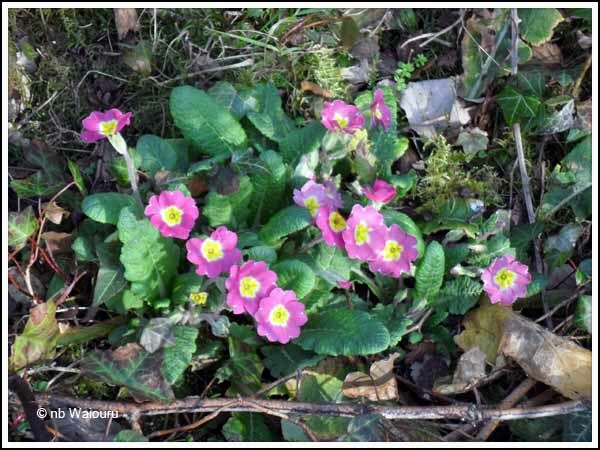 Our book of UK flora is packed somewhere, so Jan has made a guess that there are Primula. This morning she looked out the galley window to see a small deer on the opposite bank. Unfortunately by the time Jan had grabbed the camera it had disappeared. Back on eldest son’s property near Coffs Harbour, NSW there was no quacking from the ducks; no bleating from the sheep; and the pet daschund quivered under the bed. They had a visitor on the pergola trellis fence. Not a python! 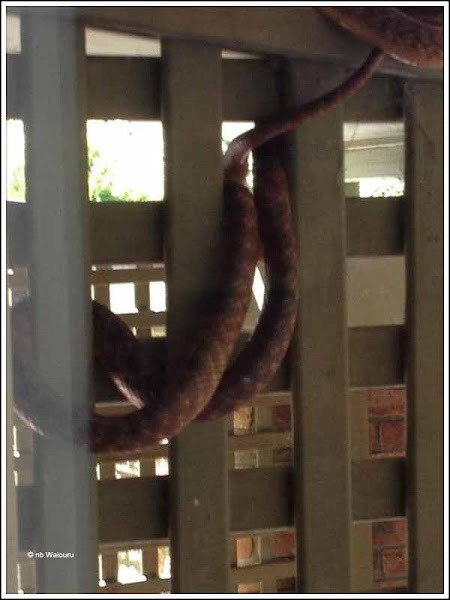 It’s a Brown Tree Snake. Not to be confused with the Eastern Brown Snake. The Brown Tree Snake is poisonous but because the fangs that carry the poison are at the back of their mouth they have difficulty injecting sufficient toxin into a human. So they are not deadly (just scary!). They mostly feed on birds and small rodents. However the venom from the Brown Snake is highly toxic making it the second most deadly snake in the world; and it can be very aggressive! Richard, James and I installed the floor this morning. They did all the technical and heavy work whilst I restricted myself to screwing down the ply sheets. They work well as a team and, like all good tradesmen, carefully think about the task before actually starting work. The strategy was to run a chalk line down the boat and work from that. This avoided potential problems associated with any irregularities in the side battens. The run of sheets is a mixture of full length and partial to ensure the ends of each sheet meet at a cross batten. 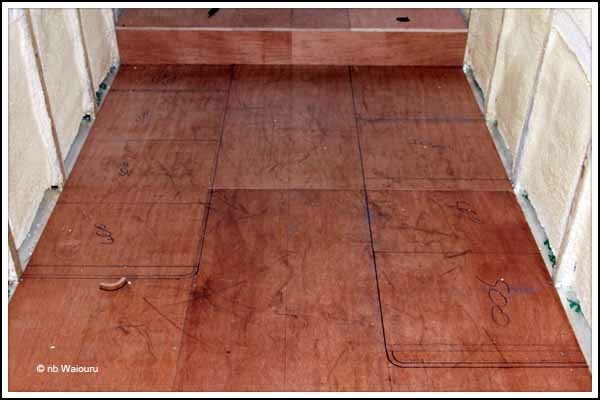 After each sheet had been tacked in place with a screw I ran chalk lines longitudinally and then across the boat creating a matrix. This ensured all the screws are exactly in line and the same distance apart. It wasn’t necessary to do this but I’m a pedantic bast*rd! If we’re going to all the trouble to build a boat then I feel it’s worth making the additional effort to ensure it’s right! 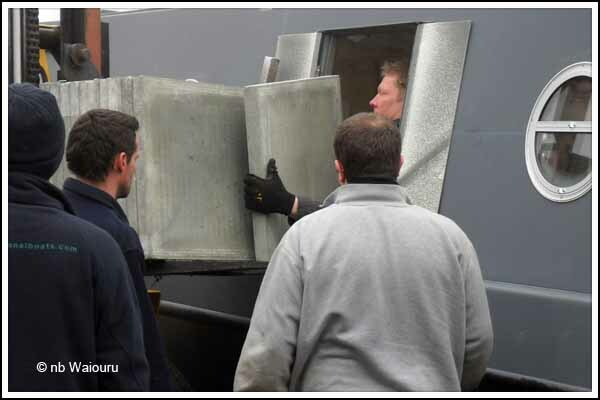 Later in the afternoon Richard and James manufactured and fitted the floor section on top of the blackwater tank. They have carefully allowed for the tank connection. At the rear are the pump out, rinse and breather pipes. The inlet from the toilet is at the front on the opposite side. Whilst they were fitting the floor Jan and I made a start trimming back the spray foam on the ceiling. It started to look a lot like Christmas We got completely covered in tiny beads of foam. Half the ceiling was completed before I was too tired to continue totally stuffed! Jan and I will finish cutting back the ceiling on Sunday. On Monday Richard, Andy and I will mark out the floor. Hopefully the wiring will be fitted later the same week. This morning there was a brief discussion regarding the best method of moving the concrete paving slabs into Waiouru. In the end Richard decided to use the forklift and side hatch. However before he and James could commence we discovered some of the timber battens would have to be removed as they were obstructing the slabs. 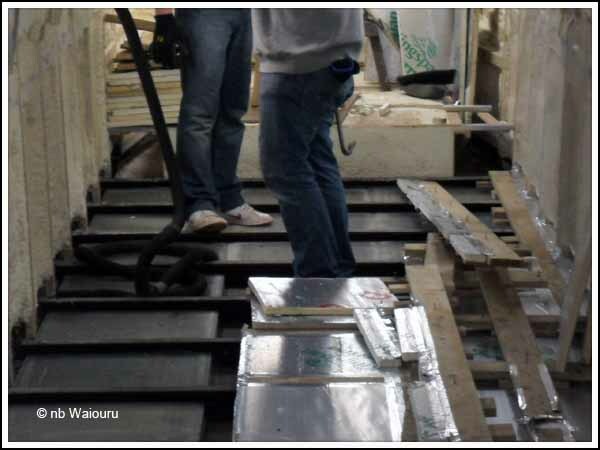 The slabs were too wide to fit through the hatch horizontally which meant Richard and James had to lift them vertically. They are too heavy for me to attempt to do any lifting and carrying. However Richard and James made short work of the task. 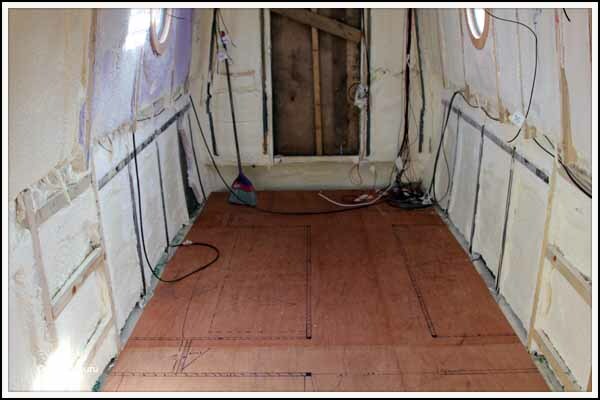 The last three bays at the back of the boat needed three slabs each to ensure there is sufficient weight at the stern, Every other bay only has one slab down the starboard (right) side for trim. Once all the slabs were fitted on top of the roof felt I was left to refit the timber battens and complete the installation of the Kingspan. 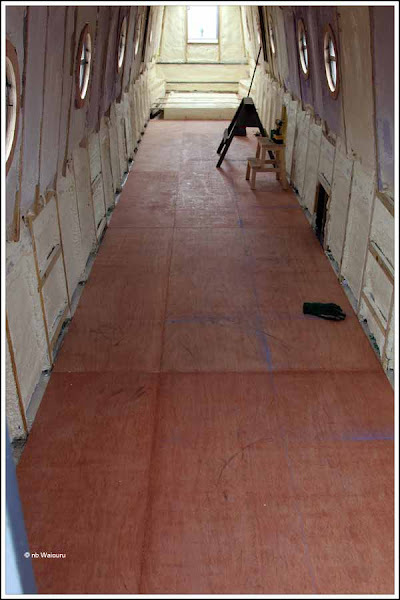 The last task for the day was to vacuum the entire floor ready for the installation of the marine ply flooring. Richard and James will mark out and cut the sheets but I know who will be installing the 600+ screws.